If you follow us on Instagram, (and you should) you may have noticed our uber stylish takeover yesterday with the latest designer to appear at Bella Bridesmaids showrooms...Parker! This ready to wear brand that you know and love have taken their love of all things style down the wedding aisle and we couldn't be more excited to bring them to you. Read on to learn all about Parker! We are SO THRILLED to be carrying Parker in our Bella showrooms! Tell us all about the brand. The feeling is mutual!! Parker was founded in 2008 out of the need for a great, silk blouse. Since the founding of the collection, the line has evolved and we’ve added leather, jackets, pants, beachwear, as well as the introduction of our evening wear line, Parker Black. Parker has seen lots of success in ready to wear. What made you decide to join the wedding world and create the Parker Black collection? We were getting such a great response from our event-specific ready to wear dresses that we realized we could create an entire collection out of them! Parker Black allows our design team to take more risks and create more elaborate gowns, and know that we will have a home for them in the dress and bridal world. Who is the Parker bride? What does she want her bridesmaids wearing on her big day? The Parker Bride is a fearless, confident woman who’s not afraid of a little sparkle. 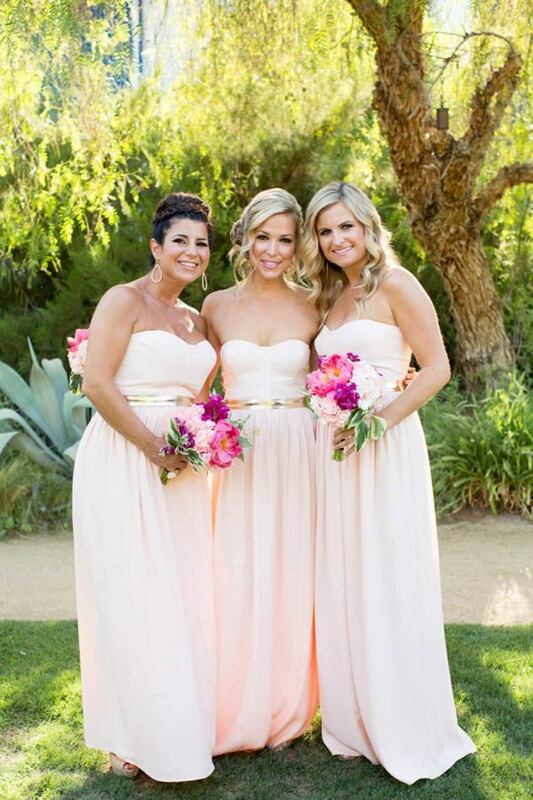 She’s wearing what makes her feel great, and wants her bridesmaids to feel the same way. Whether it be an Allegra shift, a strapless Bayou maxi, or a beaded Casey gown, there’s a dress for every bridesmaid, and every shape. What is your all time favorite celebrity wedding moment and why? Can we all just agree that John F. Kennedy Jr. and Carolyn Bessette’s was the best wedding moment of all time!? Her dress was simple yet totally glamorous. The event was responsible for setting the minimalist-luxury wedding trend in motion. And that picture of them just married, with John kissing her hand… come on! We love the Bayou dress! How would you recommend styling this look for an entire bridal party both for the wedding day and after? Brides love telling their bridesmaids that they’ll be able to wear their dresses again. Unfortunately, it’s not always the case. This is exactly why we love the Bayou dress! The strapless silk maxi is perfect for your BFF’s wedding day, and then ready to be packed for your Caribbean vacation. For the wedding day, we love how this bride brought a little bling to the blush Bayou and styled it with a simple gold belt. Absolutely perfect! 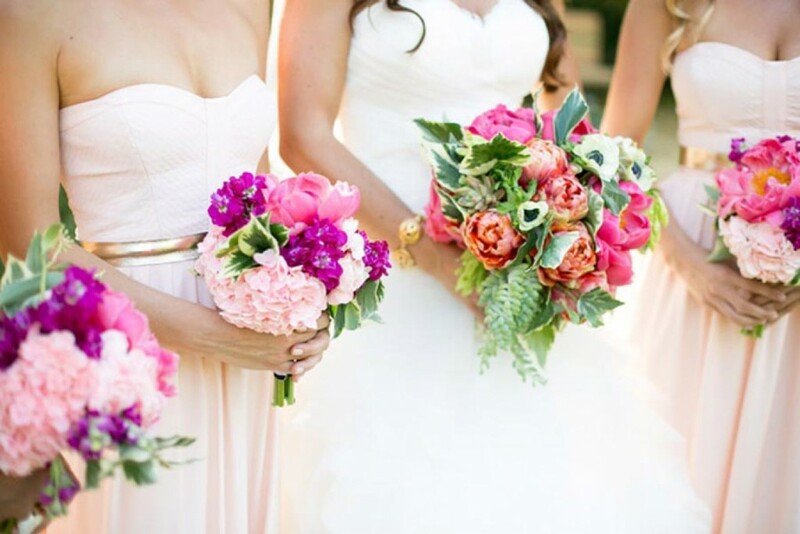 What trends are you loving for 2016 wedding? Romantic everything! The Victorian trend is all over the runways and seems to be coming back in a really big way. We love allover lace, tailored gowns, higher necklines, and bodies as intricately detailed as possible! Wedding is trending in a really fun direction and we can’t wait to see snapshots from this season’s best events.